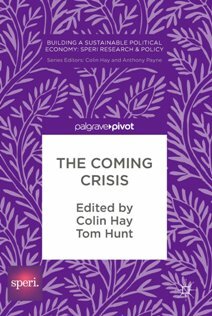 SPERI is delighted to announce the publication of The Coming Crisis, edited by our Director Colin Hay and Policy Research Officer Tom Hunt. Nearly ten years on from the global financial crisis of 2008, The Coming Crisis seeks to provide a timely warning as to the dangers still present and building in the global economic system. The new book, published by Palgrave Macmilan, draws on SPERI’s research on the political economy of growth, stagnation, austerity and crisis, placing each in the context of the wider environment crisis. Fourteen expert political economists each offer their distinct perspectives on the symptoms of the present moment – reflecting and speculating on the extent to which the world economy has become more dangerous and less stable since 2008. The book begins with an introductory essay by Colin Hay and Tom Hunt which reflects on the current sources of disequilibrium and instability and makes the case for a form of prospective precautionary thinking to anticipate and protect ourselves against a coming crisis. Far from being pessimistic, they argue that analysing the sources of future crises should lead us to be more optimistic that dangerous pathologies can be dealt with before they lead to fully fledged crises. The book explores multiple dimensions of the coming crisis through considering issues such as the post-2008 financial markets, secular stagnation, global labour markets trends, the European migrant crisis, the Eurozone, China’s development and the ecological crisis. Contributors to the book include Helen Thompson (University of Cambridge), Peter Dauvergne (University of British Columbia), Jacqueline Best (University of Ottawa) Jeremy Green (University of Cambridge), Richard Murphy (City University) and Nicola Phillips (Kings College London). The book also includes contributions from within SPERI’s research team with chapters from Martin Craig, Tony Payne, Genevieve LeBaron, Scott Lavery, Andrew Baker, Matt Bishop, Jonathan Perraton and Andrew Gamble. The book originated in a 2016 SPERI blog series on the coming crisis. The book is the latest in SPERI’s book series with Palgrave Macmillan ‘Building a Sustainable Political Economy: SPERI Research and Policy’. Visit http://www.palgrave.com/gb/book/9783319638133 for more details about the book, and to order a copy.